Image from weheartit.com, edited by me. 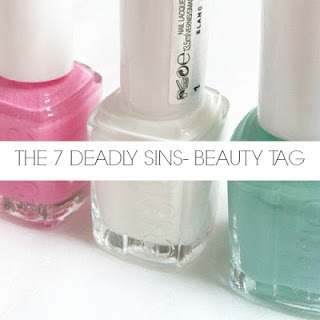 So I was having a browse through some of the blogs I follow and I noticed that Molly from What Molly Loves has done the 7 deadly sins beauty edition tag, so I thought I'd jump on board! GREED - What's your most expensive beauty item? Skin care: it would be my Clarins Pure Melt Cleansing gel as that retails for £18, I'm more of a drugstore lover when it comes to skincare. SLOTH - Which product do you neglect the most due to laziness? Like Molly, I definitely neglect my makeup brushes. I have such a big collection that I get bored having to cleanse them all the time, but I do cleanse them at least twice a month. I always tell myself that I'll do them on a certain day...but that day rarely comes! Eyeshadow. I've got really weird shaped eyes, so sometimes I love it but other days I feel like it makes my eyes look bigger, which they definitely don't need! I think the fact that I have fair skin with dark hair makes this love/hate relationship because I find it difficult to get eyeshadows that go nicely with my complexion. GLUTTONY - What brand makes up most of your makeup collection? Without a doubt foundation. Makeup gives me a lot of confidence and my skin isn't the world's greatest so I like to hide behind my foundation, there's no way I'd be seen without it! LUST - Which item is at the top of your wishlist? Skin care: I really want to try the Liz Earle Hot Cloth Cleanser mainly because I've heard so many good things about it. Makeup: I realllllllly want to try the NARS Pure Matte Lipstick because as you know, matte lipstick is my thing. I don't own any NARS lip products so I'm dying to give this a whirl, hopefully it's going to be a payday item. ENVY - Which makeup look is great on others but not yourself? Blusher and smokey eyes. I just feel that my face is too round for blusher and I can never seem to get it looking nice, and when I have grey/black or any dark toned smokey eyes I end up looking like I've been punched in the eye! And we all know that's not a good look! And that's it, if you've done one, please give a link in the comments below so I can see what your seven deadly sins are!